US Vice President Mike Pence had to break a 50-50 tie as the Senate voted by a hair to start debating Republican legislation to tear down much of the Obama healthcare law. While the vote gives president Donald Trump and Republican leaders a crucial initial victory, the Senate now faces 20 hours of debate and a long parade of amendments. What does the vote mean for Trump? The 51-50 vote kept alive hopes of delivering on promises that countless Republican candidates have campaigned on for years – repealing Barack Obama’s 2010 healthcare overhaul. Technically, Tuesday’s vote meant the Senate would consider a measure the House approved in May eliminating much of Obama’s statute. Like legislation Senate majority leader Mitch McConnell crafted mostly behind closed doors – and has since revised – it would eliminate Obama’s tax penalties on people not buying policies, cut Medicaid, erase many of the law’s tax boosts and provide less generous healthcare subsidies for consumers. What exactly happened during the vote? Moderate Senators Susan Collins and Lisa Murkowski were the only Republicans to defect from their party’s quest. Their complaints about the legislation had included its cuts in Medicaid, the health insurance programme for the poor, the disabled and nursing home residents. Not a single Democrat backed the effort to overthrow Obama’s signature domestic legislative achievement. In an unusual move, most of them sat in their states during the climactic roll call, eyeing Republicans as they cast their votes. Any pivotal votes to mention in particular? Senator John McCain flew to the Capitol just days after revealing he had been diagnosed with brain cancer and was home considering the next steps in his treatment to cast his his “Yes” vote with two thumbs up. 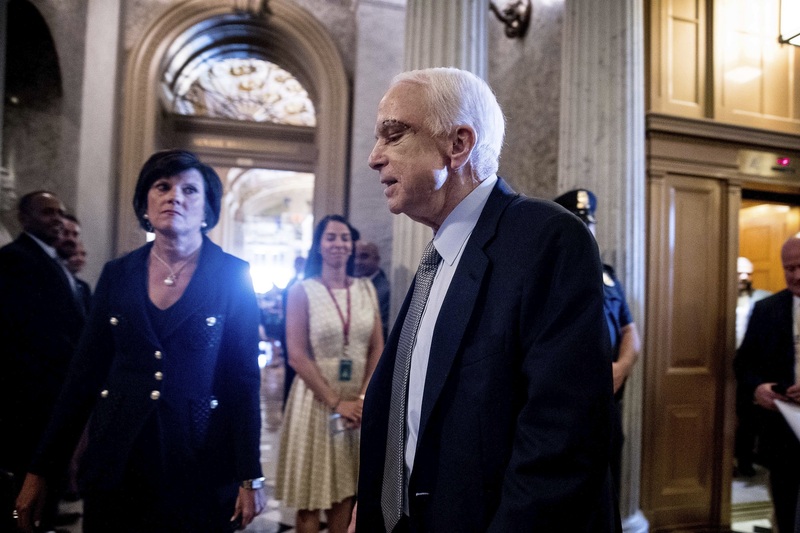 With Republicans wielding a narrow 52-48 majority, the 80-year-old’s appearance let McConnell lose two Republican senators and still prevail – wriggle room that would have shrunk to just one in McCain’s absence. McCain entered the chamber 29 minutes into the roll call to a standing ovation from members of both parties and visitors watching from above. The Senate faces 20 hours of debate and a long parade of amendments, and if a measure eventually emerges it is likely to look quite different. Because the chamber’s moderates and conservatives are so divided over how to replace Obama’s overhaul, leaders have discussed passing a narrow bill repealing only some unpopular parts of that law – such as its penalties on individuals who eschew coverage – with the ultimate goal being to negotiate a final package with the House.